Some dogs are large while some are small. They come in all shapes and sizes, colors and markings. Dogs have been bred with the hopes of achieving specific qualities per breed, and across this diverse spectrum, it can be said that there is a breed for everyone. Perhaps you’re a dog lover, ready to welcome a furry best friend into your abode. You might live alone, in a confined dwelling or you might even suffer from dander allergies. These exemplary factors might’ve deterred you from owning a dog in the past. Now, we’re here to let you know- friend, have we got the perfect little barker for you. Meet the Maltipoo. This crossbreed is a designer favorite, specially bred to be hypoallergenic by crossing two small-sized breeds known for their allergy-fighting fur: the Maltese and the Toy or Miniature Poodle. Fun, playful and always ready to put a smile on a human’s face, the Maltipoo has a lot to offer in terms of companionship. In this post, we’ll share all you need to know about this perky, pint-sized hybrid. Where Did the Maltipoo Come From? What do Maltipoo Dogs Look Like? Does the Maltipoo Have Any Health Issues? Are You Ready to Buy a Maltipoo? Before we take a trip down doggie lane, let’s talk about a few of the best-known character traits associated with this Maltese Poodle mix. You can look at a puppy’s parents to get clues about how the puppy could possibly turn out when it comes to appearance and temperament. But, it holds true that when you mix two breeds, you just don’t know what you’re going to end up with. These small dogs tend to be little smarties, hence they’re easy to train and learn quickly. They were bred to be hypoallergenic, but please know that NO dog breed is 100% hypoallergenic. All dogs shed skin cells and dander. Maltipoos are sweethearts, with gentle and sensitive dispositions. Poodle mixes with a similarly affectionate nature include the Lhasa Poo and the Cavapoo. There is a small guard dog side to this breed. They like to alert the world to anything new and unfamiliar with a cacophony of barking. There will be some grooming expenses to expect with this breed. Daily brushing is required to prevent matted, tangled fur. Maltipoos don’t like to be left alone. They’re known to develop separation anxiety. The Maltipoo breed is evidence of the incredible art of dog breeding for traits- such as hypoallergenic traits. The first Maltipoo made its debut in the USA, although it’s unclear who was the first breeder to claims rights to this hybrid. Since it hasn’t been around for long, the Maltipoo is not officially recognized. The North American Maltipoo Club and Registry exists for those who adore this peppy breed. Crossbreeds can be tricky to navigate. That’s why we can learn a lot from their parents. Let’s look at the awesome breeds behind the genes of the Maltipoo. This ancient breed originates from the Central Mediterranean region of Malta (hence the name Maltese). It’s hypoallergenic with long, snow white fur that can be wavy or curly, and it has no undercoat. The Maltese were originally bred for its small size, growing up to 10 inches tall and weighing up to 10 lbs. Temperament-wise, these are companion dogs that love to be around humans. Lively and playful, they are known for their high level of intelligence. It’s important to introduce Maltese to training and socialization at a young age to keep them stimulated. Hands-on training also thwarts the development of destructive behaviors. Maltese tend to exhibit signs of separation anxiety and can also be snappy with small children if not supervised. The Maltipoo gets half of its genetic makeup from the Toy or Miniature Poodle, which was bred from the Standard Poodle. No matter if it’s Toy or Mini- this breed is considered to be the same. The Poodle has been winning hearts since the 15th century. It became so popular in France, that it was named as the country’s national dog. There are some notable traits that this breed possesses. Besides its signature hypoallergenic curls, the Poodle is recognized as the second most intelligent dog breed behind the Border Collie. Its sharp wit has made it a top contender in a variety of dog shows and competitions that test agility, obedience, tracking, herding and even circus performing. Lovers of small-sized pooches on the hunt for the perfect canine that retains its soft puppy looks into adulthood JUMP on the Maltipoo. It’s considered to be teacup or tiny toy size, having come from small breed parents. So, what makes the Maltipoo such a cutie? When you try to conjure up a realistic image of the Maltipoo, just think of when you were a child looking in the window of a toy shop. There was that one stuffed animal with black button eyes, bear ears and a plush tummy begging to be squeezed. Your eyes couldn’t leave that stuffed toy, as you squished your ruddy cheeks and pudgy hands up against the shop window glass. It was, indeed, the most adorable little doll you had ever seen in your life and either your parents or Santa Claus just had to get it for you. Comparing a Maltipoo to your favorite stuffed animal is the best description I can give here. This breed was built for cuteness and cuddles. Standing up to 14 inches tall and weighing up to 20 lbs, the Maltipoo is small and sensitive, better suited for life indoors. It boasts a fluffy coat that feels like wool and can be medium to long in length with a wavy texture. Generally, the Maltipoo has low-shedding fur that is hypoallergenic. Low to the ground with floppy ears and a shaggy short tail, the Maltipoo’s coat comes in a melange of colors that can be cream, white or silver. When it comes to Maltipoo health, it is long-living breed with an estimated 12 to 13 year lifespan. White Shaker Syndrome: This condition causes full body tremors in small dog breeds and is associated with high stress. Epilepsy: Seizures from unknown causes. Patellar Luxation: A common knee joint abnormality found with teacup dogs where the kneecap dislocates from the thigh (femur). Portosystemic Shunt: A defect where an abnormality forms between the portal vein and another vein, causing blood to bypass the liver. Progressive Retinal Atrophy: The degeneration of the retina that can cause vision loss and even blindness. Legg-Calve-Perthes Disease: This disease causes the hip joint to slowly disintegrate spontaneously. When visiting Maltipoo breeders, it’s always important to question them about the health history of the parents. 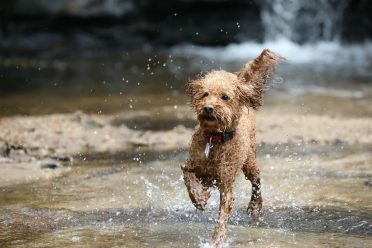 Check that both parents have health clearances from the Orthopedic Foundation for Animals for patellas (knees) and thyroid and from the Canine Eye Registry Foundation (CERF). This ensures that eyes are healthy and a DNA test has been done to detect progressive retinal atrophy (PRA). If you’re looking to buy a Maltipoo puppy, keep in mind that health clearances aren’t issued to dogs under two years of age. Small-dog breeds tend to have speedy metabolisms, so this is something to consider when setting up your Maltipoo for diet success. Think about supplementing 30 to 40 more calories per pound of body weight as compared to a larger dog. Strive for high quality, protein-packed dog food that is free of grain and fillers. Fill her bowl with 5/8 to 1.5 cups of food, divided into two meals per day. The Maltipoo is a surging bundle of energy and is always ready to play! Stock up on toys and a leash to help keep this crossbreed active. Shoot for at least 10 to 15 minutes of exercise per day. This can include a brisk walk around the neighborhood or some tug-o-war with a chew toy. Daily exercise helps ward off destructive behaviors such as chewing that can occur when your Maltipoo gets bored. We’ve already talked about the low-shedding, potentially low-dander benefits of the Maltipoo’s fur coat. Nonetheless, this crossbreed can be high maintenance in the beauty department and calls for a good amount of grooming to maintain a healthy coat that doesn’t get matted and tangled up. To keep unsightly knots from forming, brush the entire coat daily. Baths should be given at least once a month for supreme softness. 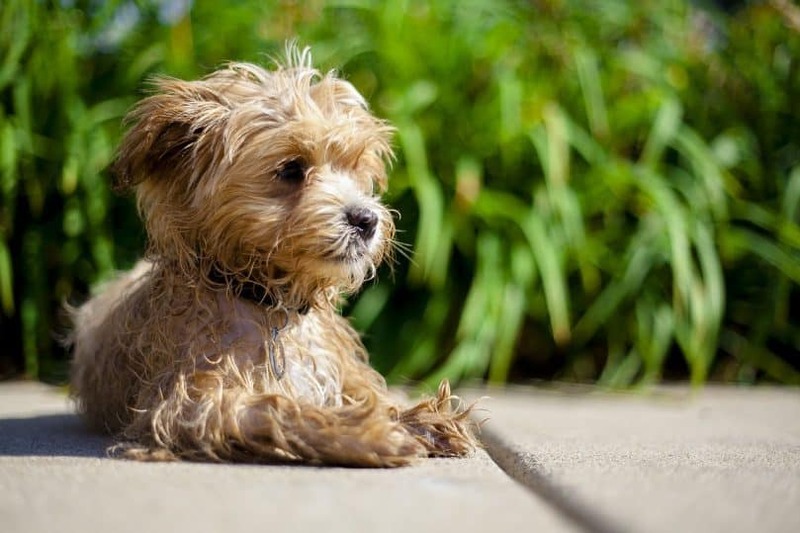 Don’t neglect those shaggy Maltipoo ears! They trap dirt and debris easily and need a thorough cleaning. Maltipoos can make do with a solid clipping at least once or twice a year. The hair on the head will need special attention from the scissors monthly, especially around the eyes and ears. What’s better than a dog bred for companionship? The Maltipoo is the complete package if you’re looking for a cuddle buddy that always wants to please you. Active, fun and loving, this crossbreed adapts to any type of living situation, whether your home is a castle or a tiny New York City apartment. 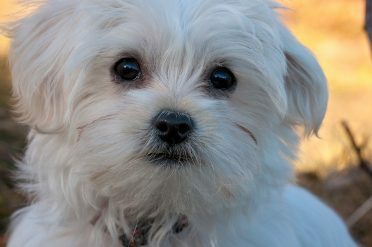 Gentle and sweet, Maltipoos are an ideal choice for first-time dog owners. They also do well with children and other pets. Due to their easy-going manner, they are especially well suited for older adults who may live alone and need a little friend that’s easy to care for. Although Maltipoos are lovers this makes them a bit needy in the emotional department. They don’t like to be left alone, resulting in the development of separation anxiety. They are even prone to depression as a result of too much alone time and have been known to self-inflict harm by pulling out their fur or chewing on the skin. Behavior-wise, this is a smart dog that learns fast and is easy to train. 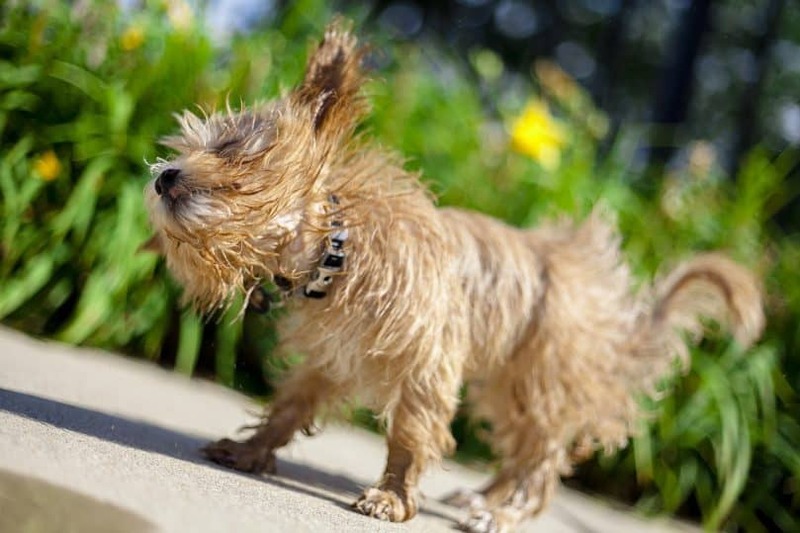 This is essential to prevent excessive barking– an undesirable trait this small-dog breed is known for. As we mentioned above, these dogs can take barking to the extreme, annoying your neighbors, the mailman or even the casual cat that passes by your yard. The high energy Maltipoo can also be destructive if bored, chewing up your precious shoes and leather treasures with finesse. Training and socialization is the answer to curbing these bad habits fast. Luckily, the Maltipoo adapts to training exceptionally well, learning fast and easily. Keep in mind that due to their sensitive nature, Maltipoos do not respond well to heavy-handed training methods. Show them patience and love and they’ll give you all that they’ve got! Here are 3 ways to get your Maltipoo behaving like the angel she is. Dog lovers tend to have mixed feelings about crate training. This practice requires strict adherence to a crate or cage schedule. A lot of time and dedication goes into ensuring the crate is used in a constructive manner. Throughout the day, your dog must be kept in her crate for short periods of time to cultivate a “safe haven” type of environment. This teaches your dog that the crate is where she can go to de-stress within familiar confines with familiar smells. It also keeps dogs from roaming freely throughout the house when their owner is out, minimizing the potential for destruction. Most importantly, crate training helps housebreak puppies. Dogs do not like to defecate in their area of sleep, so putting her on a schedule to go out to relieve herself and come back to the crate helps develop a potty schedule. Crate training needs complete dedication and seriousness to work. If not, your dog could learn to see the crate as a tool for punishment or she won’t take it seriously at all. Careful steps need to be taken when setting up the crate as well, to avoid dangerous situations that can be fatal to your dog, such as strangulation from wearing a collar or breathing issues from poor ventilation. For example, when it comes to your small-sized Maltipoo, don’t rush out and buy the biggest cage you find thinking the more room she has to move around, the better. Too much space leaves your Maltipoo the option of turning a corner of the crate into a potty, which defeats the purpose of housebreaking. The crate size should be just big enough for your Maltipoo to turn around easily, stretch out her legs while lying down and sit up without hitting her head on the top. This type of training is an ongoing process best begun at a young age. It requires a specialized handler that works closely with the owner and dog to shape good behavior and an apt response to commands. Obedience training doesn’t necessarily need a specialized trainer involved. The owner can undertake the task, but this calls for a great deal of patience and dedication. So, if you don’t have a lot of time on your hands, hiring a trainer could be the best bet for you and your pup. Maltipoos do well with obedience training since they learn quickly. But, keep in mind that it might be best to do this type of course together, as they prefer to be around their owner and can get anxious when left alone. So, if you don’t have the time, another training route might be more beneficial. A basic beginner’s course lasts from 6 to 10 weeks. It helps teach your dog to obey simple commands and most importantly, how to walk properly on a leash. Socializing a dog is much more than just getting her used to interacting with other dogs. Socialization builds her canine confidence in order to deal with anything unfamiliar, whether it be a new environment, people, objects or noises. This helps control a dog’s initial aggressive reaction to something, or in the Maltipoo’s case- excessive barking. Dogs have feelings too, and socialization helps them cope when times get “ruff”. Introduce new environments to your dog gradually, so she can get used to her surroundings. This may include walks in the park. Keep your dog on a leash and incorporate a muzzle if other dogs are present. Allow her to watch, explore and sniff from a safe distance. After reading all about the Maltipoo, you’re ready to hop in your car and speed over to the next breeder to wrap a puppy up in a bear hug and call it your own. Before you embark on a mission to find Maltipoo puppies for sale, it doesn’t hurt to be picky when shopping around. They’re popular designer dogs, and with popularity comes the onslaught of riff-raff looking to make a quick buck off the sale of a puppy. Steer clear of puppy mills, auction websites and pet shops that treat their puppies like merchandise instead of living, breathing creatures that require love and care. Instead, take your time to research Maltipoo breeders. Do they have references or customer testimonials? A worthy breeder cares about their reputation, and good reviews are solid proof of integrity. You can also ask for recommendations from veterinarians. Always visit the breeder to check out the living conditions and to meet the Maltipoo parents. After all, it kind of is like a first date! Ask questions about the parents’ background and medical history. If a breeder doesn’t want you to come near the premises, they could be hiding something…like tons of dogs being bred in deplorable conditions (cough…puppy mill). If you’re looking for a Maltipoo that will stay a particular size or look a certain way, keep in mind as well that with crossbreeds, there is no guarantee how it will turn out as an adult, so be wary of breeders that make any promises in regards to this. The cost of a Maltipoo? Expect to pay anywhere from $400 to as much as $2,000 for a puppy. If adopting is more your jive, check out these wonderful Maltipoo rescues that have lots of cute faces waiting patiently to go to their forever home. North American Maltipoo Club and Registry Rescue: A worthy resource for all of your Maltipoo needs. This organization is dedicated to the ethical care and keeping of Maltipoos, also helping to rehome rescues. Poo-Mix Rescue: This handy website searches for Maltipoo rescues all over the US and Canada with informational posts that can be found all in one place. Who can resist that shaggy face with those thick eyebrows, shining eyes, and bearded face? The Maltipoo is indeed a cutie patootie. There’s also no disputing its charming behavior. With a Maltipoo, you get the best of the Maltese and the Miniature or Toy Poodle breeds. Although it can be difficult to discern how a crossbreed will look or its temperament, the Maltipoo is no doubt working with some top-tier genes. High intelligence makes it a breeze to train and its disposition is gentle to begin with. 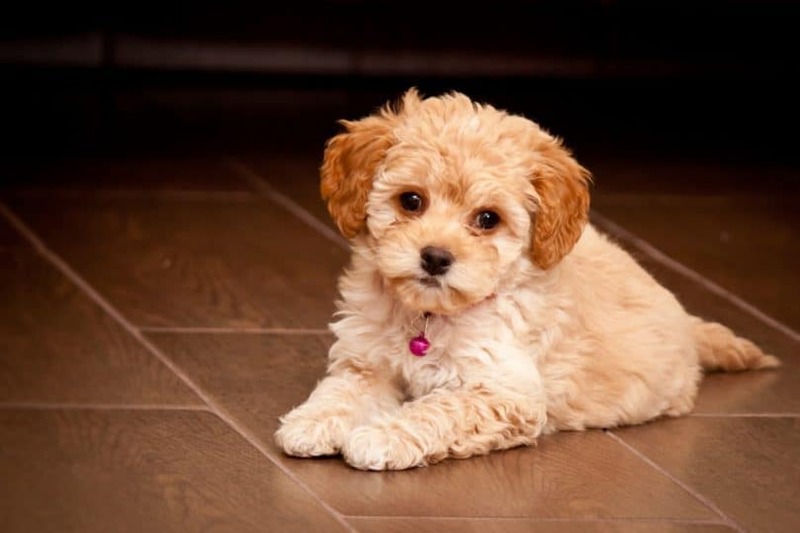 As a companion dog, the Maltipoo is affectionate and playful. It loves to be around humans, children and other pets. Just be wary that it can get separation anxiety if left alone for long periods of time. Training and socialization are key to ensure your Maltipoo is well-behaved and goes easy on the barking. Other than being prepared to administer regular grooming, you’ve got a companion that is low-maintenance and great for first-time pet owners. Is the Maltipoo for you? Tell us what you think in the comments!